PerfectPrimer® is a complete floor prep system and primer/sealer. It forms a powerful molecular bond between nearly every coating or modified cement, with any clean, sound substrate including: wood, cut-back glue, sealed concrete, metal, roofing materials, ceramic tile, VCT, epoxies, masonry, and linoleum. No mixing required. Comes ready to use. Tintable. SlabTight® Shield for concrete is a vapor barrier and coatings primer in one. It is based on chemically stable resins with extremely high resistance to moisture vapor transmission. It forms a vapor resistant film on concrete and porous masonry to help prevent gases and vapors from diffusing through the substrate surface from either side. IronBack® for steel is the complete rust conversion and paint prep coating. It converts rusted steel into stable, black metal, removes oxygen bubbles trapped in the steel to prevent future rusting, and encapsulates the metal with a corrosion protective barrier. It primes rusted and non-rusted steel alike and binds with your water or oil based paints. Concrete coatings primer, Sealer, Waterproofing, and Concrete Crack Repair Isolation all-in-one. This liquid applied, fabric reinforced waterproof membrane and flashing system is the perfect underlay for your overlay coatings or finishes. PerfectMembrane® is made by embedding our Polytex Fabric® into our PerfectPrimer®. This cures to form the all-purpose, surface prep membrane for use over any substrate. It bonds concrete, wood, tile, mastic or asphalt surfaces, to epoxies, acrylics, urethanes, or polymer cements. Waterproofs any deck, terrace, roof balcony etc. Encapsulates asbestos and lead particles in existing concrete and coatings. Use indoors and out. Non-Toxic. Cleans up with water. PerfectRoof® repair kit forms a waterproof crack isolation membrane that allows the repaired sections to safely move together in every direction. It’s perfect to repair seams, tears, leaks, flashing’s, coping stones, skylights, penetrations and more. It’s the do-it-yourself way to make fast, easy, economical, durable roof repairs. Repair seal, leaks, tears, skylights & more. Complete turn-key kit with everything you need. Easy clean up. Applied to new or existing roof. Environmentally friendly. Sand-Rich® is a Flexible-Stone Decorative Waterproof Overlay System. Adheres to virtually any substrate. Ideal deck resurfacing system for flat roofs, terraces, balconies, patios, etc. The most beautiful of concrete decorative floor finishes… the ultimate concrete floor repair! 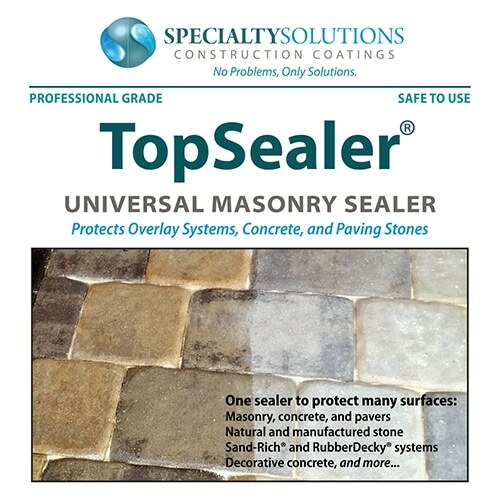 Can be applied to virtually any surface, including: wood, tile, concrete and asphalt. Non-skid surface exceeds all ADA and OSHA standards. Withstands rapid climate changes and freeze/thaw cycles. Protects against rust and Ultra-violet damage. Won’t rot or dry out. RubberDecky® The World’s Easiest and Most Economical Resurfacing System! Flexible waterproof overlay system for patio to roof deck. Great for flat roofs, terraces, balconies, patios, foundation walls… Adheres to virtually any substrate, including wood, tile, roof membranes, etc. Resists bacterial growth. Salt spray resistant. Flexible and strong. Will not crack. Is a perfect DIY system. Requires no special tools. Never needs painting. Environmentally friendly. Non-skid texture. Contains no cement. Tints to many colors. Ideal for projects with a tight budgets. DIY kit includes everything you need. Works with all building materials. Environmentally friendly. Easy water cleanup. For fast, easy, durable concrete crack repairs. PerfectCrack® repair kit forms a waterproof crack membrane that allows the repair and slab to safely move together in every direction. Use PerfectCrack® to make repairs on concrete wood, metal, or almost surface. Easy concrete crack repairs without “V” routing. No messy tar, or epoxy. Compatible with concrete overlays, epoxy, paints, urethanes & more. Leaves repaired surface primed and ready for your paint or epoxy etc. Reduce future movement cracking in topcoats finishes. Water cleanup, seamless & flexible & environmentally friendly.